My plan to be more organised has been completely blown out of the water in the past couple of weeks so my apologies for the delay in posting here. Not only is this an incredibly busy time for planting out all the veg that I've been hardening off but I managed to squeeze in three garden visits in three days after a day down on the Hampshire coast. I was in Hampshire with my brother to sort out the funeral arrangements for my mother who died peacefully almost three weeks ago on 9th May. When she went, I felt it was a release for her. Long time readers of this blog may remember that my mum suffered from dementia, a cruel disease of the brain which slowly builds over years to impede normal life, conversation and memories. I like to think that her spirit is now back to how I knew her - smiling, chatty, interested in everything and everyone, hopefully reunited with my dad and free. Tiny spaces gave her claustrophobia and she loved being outdoors. It's a huge relief that she is no longer cooped up in the (albeit very good) care home where she spent the last year, just sitting with strangers and well meaning staff but not entirely confident that her visitors were, in fact, her beloved children and grandchildren. In my heart I know that she would be glad it's over. She had a great life, lived to the full, loved by all and loving. Here's to you, Mum. 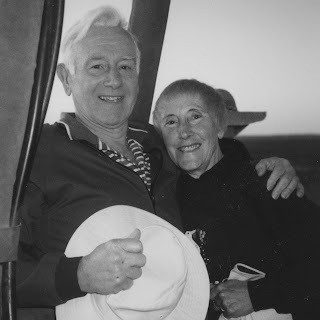 Mum and Dad up in a hot air balloon, Australia 1994. But back to gardens. My visit to Hampshire was originally planned to coincide with a visit to a rather fabulous private garden near Petersfield, courtesy of the Garden Media Guild. The garden belongs to Rosemary Alexander, a landscape architect and gardener who founded The English Gardening School at the Chelsea Physic Garden. 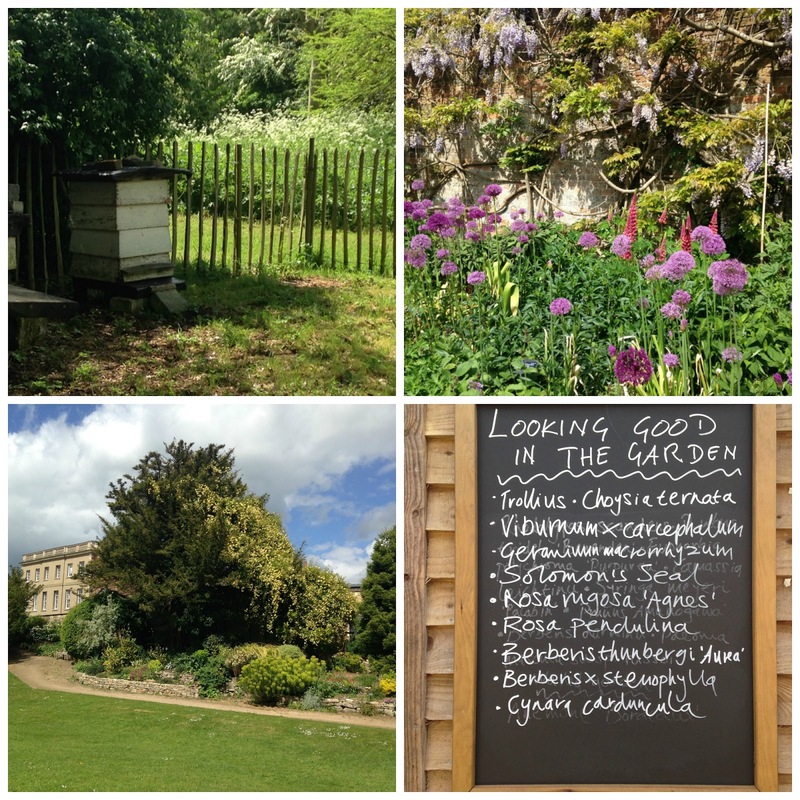 I was slightly in awe of her before I went but the beauty of these visits is to meet the owners; Rosemary is warm, welcoming and an engaging talker - and readily prepared to point out all the mistakes in her garden. (Although we really wouldn't have noticed!) Her garden is full of inspiration, including topiary, an inherited dwarf apple tree, fabulous plants and a cool green woodland area that would be just heavenly in this week's heat. The next day my tiny car wound its way to the RHS Malvern Spring Show in Worcestershire. As I missed the deadline to apply for Press Day at the Chelsea Flower Show, I thought I'd head up to Malvern as I'd not been before. The drive through countryside was lovely - and quite exciting to suddenly spot the Malvern Hills in the distance! - but, once there, I felt that the show itself over-emphasised food, sitting areas and trade stands and, unless I missed the obvious, only a tiny handful of show gardens. The Floral Marquee, usually a highlight of the shows for me, was so packed with people (it being a Saturday when I went) that I didn't linger and saw very little of interest apart from one gorgeous striped Lily of the Valley. I would have bought it but was told, "they're all gone" by the sour little man running the display. Perhaps he'd had enough of the crowds too. There were a few highlights: Buckfast Abbey's Millenium Show garden was popular and I thought it rather lovely, once I'd been able to squeeze myself through the surrounding throng. 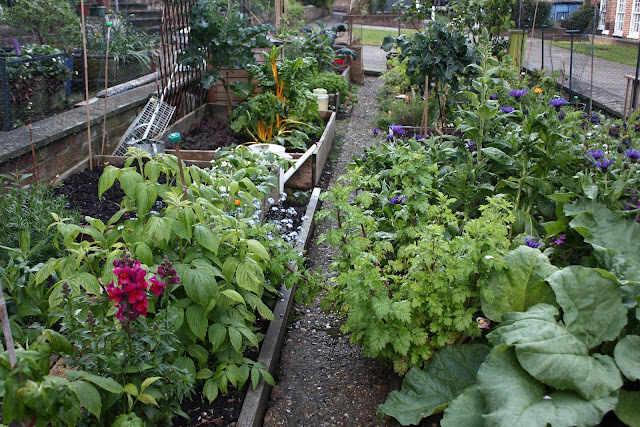 As a keen herb grower I wanted to see the herb-based 'Health and Wellbeing' garden designed by Jekka McVicar and the Edible Gardens, raised beds which showcased what can be achieved in spare ground and small corners. It was here that I found fellow blogger Sara Venn, she of Incredible Edible Bristol among many other gardening exploits, and her friendly team. 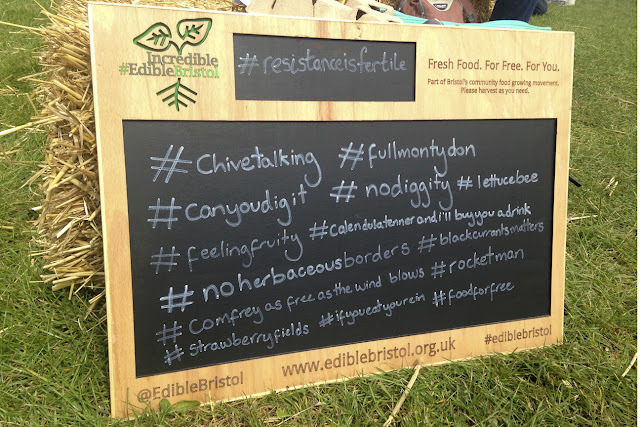 This hashtag board sums up the feel good vibe in that area! I broke my journey home with a short visit to my niece in Oxfordshire. Sunday dawned bright and clear and as the family live a short drive away from Waterperry Gardens in Thame, we headed over there to give everyone a good run around. I haven't visited Waterperry often but it's always a delight to be there. The garden has a very special history and atmosphere, especially the river walk and the long borders which are dazzling now. With small children in tow, and having been totally distracted by the beautiful meadows, there wasn't time on this visit to linger over the rows of espalier and cordon pears and apples - I last saw them bare branched in February and they're definitely a sight worth seeing! I'll write more about all of these garden visits in future posts but in the meantime I'm having to focus on what I'm growing at home - the windowsills and balcony are all full up, I have more seeds to sow and a ton of planting out to do. And, despite all the fabulous advice given to me about growing pea shoots, trial #2 produced one shoot and trial #3 is yet to produce anything. I think I might have found my gardening nemesis. I have to confess to my first major fail of the season. As part of my all year round salad bar, I thought I'd grow some pea shoots as they're reputed to be quick and incredibly easy to grow. The first time I became aware of pea shoots was while watching Alys Fowler rave about them in her 2012 series 'The Edible Garden'. As I recall, she made pea shoot cocktails out of her harvest. I remember thinking "Eeeuww, really?" (These days I'd probably think it was delicious.) A bit of googling reveals that the Pea-tini cocktail (as it was) is the brainchild of chef Mark Hix who created it during a campaign to promote pea shoots to diners. At that time, I don't remember pea shoots being very mainstream as a salad leaf but I've read that they were available in M+S and Sainsbury's (big UK supermarkets) in 2008. How far have we come since then! These days they're much more readily available - but, as with all salad leaves, why not grow your own and avoid eating a cocktail of chemicals? Supermarket salads are washed with chemicals to prolong the shelf life of the leaves. My opinion of pea shoots was changed for the better a couple of years ago when the meal served for supper at a friend's house was pea shoots with pulled ham hock, peas, watercress and a dressing. There might have been mint in there as well; what was memorable was it's tastiness. But still I didn't grow pea shoots as a salad leaf, even though I grew peas in the veg patch. Striving for a full year of salad leaves, I hope to change all that but I'm having to start again. 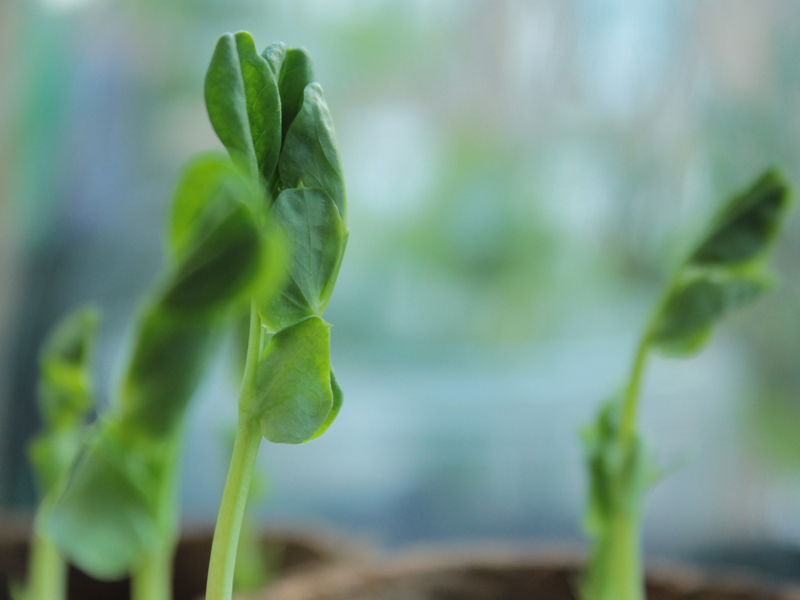 As far as I can tell, pea shoots can be grown from any pea seeds whether they're the remnants of last year's packets or supermarket dried peas. I had some leftover seeds so filled a box with compost, pushed pea seeds into the compost and watered them. A week later the lettuce leaves that I'd sown had all germinated but there was a complete lack of action from the pea seeds. I gave them a few more days. Nothing. So I poked around a bit which was when I discovered ... mushy peas. There were no signs of germination, just globules of pale mush. I've now started again but this time using supermarket dried marrowfat peas and watering slightly less. 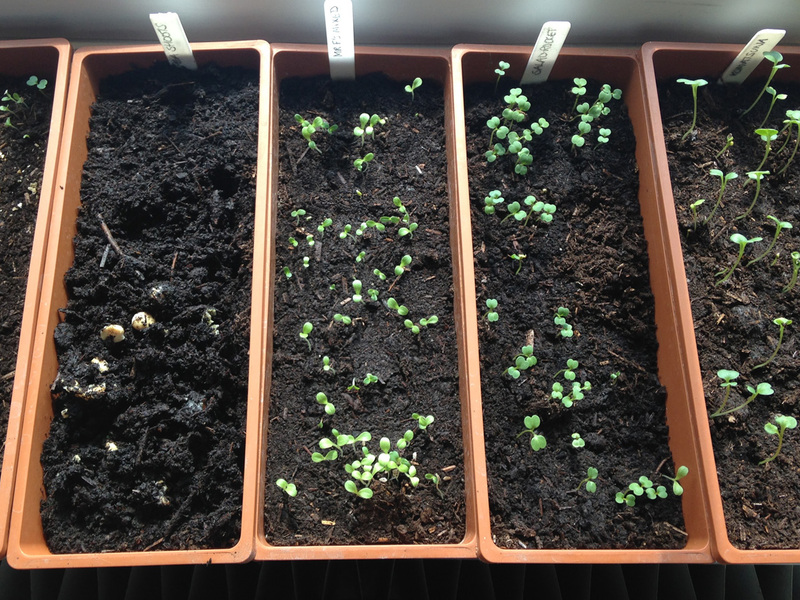 And there will be NO poking around as I've since learned that pea shoots can take a bit longer to germinate. Let's see how that goes. What I'd like to know, though, from anyone that has successfully grown pea shoots, did I do anything wrong? Do the pea seeds need less watering; are they prone to going mushy; has anyone else found that they've had mushy peas rather than pea shoots? 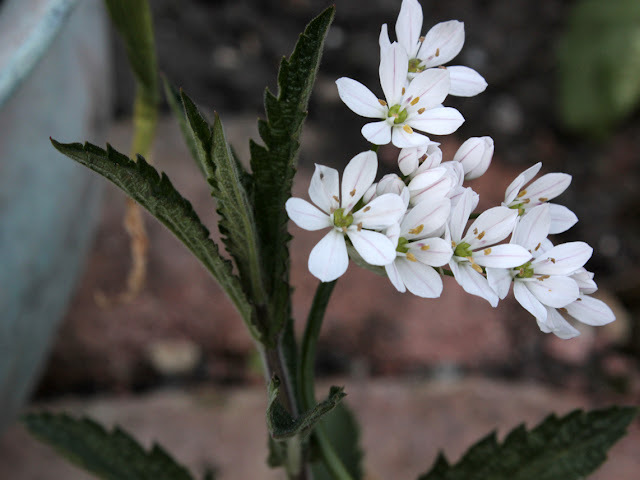 A couple of things that might be to blame is perhaps I didn't sow the seeds deep enough; I gave them a light covering of soil rather than pushing them down about an inch. Also, I used multi-purpose compost rather than lighter seed compost and watered them in well; perhaps that was it? If there's any light to be shed on this mystery, please do tell. I'm sowing a range of salad leaves into small window boxes (above photo). Some of these seedlings will be pricked out to be grown into bigger plants and the rest left for cut and come again leaves on my balcony. First salad leaves were sown on 30th April. Mr Fothergill's mixed leaves appeared on day 4 after sowing. Lollo Rosso leaves had poor germination rates but were from an older packet. Second sowing on 14th May. all about the alliums. I first wanted more alliums in the veg garden when some end of season white onions flowered and were subsequently smothered in bees busily harvesting pollen in the summer sunshine. 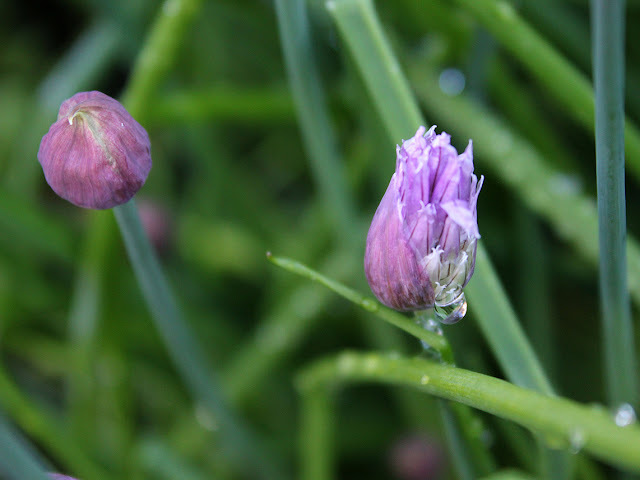 If you don't mind the smell of onions, alliums are such a great flower to have in the garden. They're usually out by the end of May* providing a valuable source of food to lure bees in to the veg patch to pollinate crops; they lightly self seed so are brilliant value for money; they're unfussy, needing only a sunny spot and relatively free draining soil; they're great in containers, superb as a cut flower and they're (mostly) purple - my favourite colour! 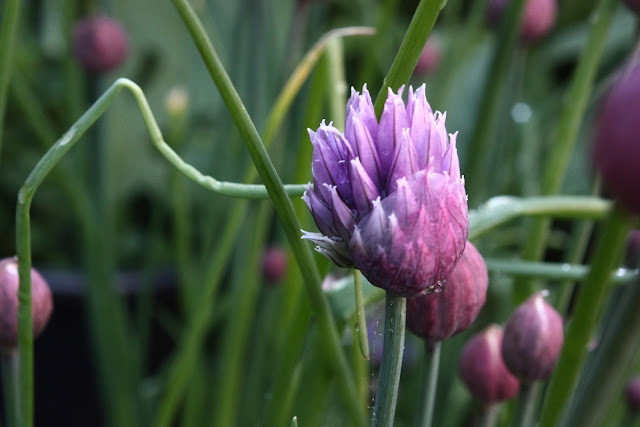 Some alliums, such as garlic, chives, leeks and onions are edible while ornamental alliums are not. 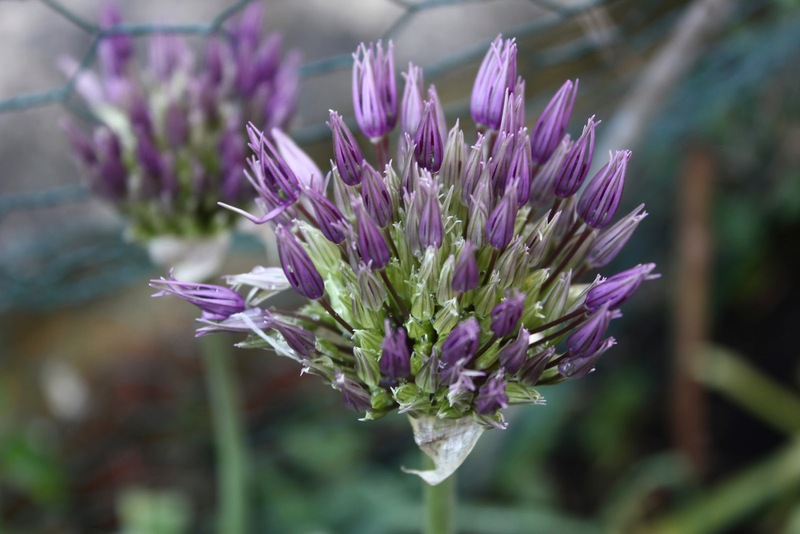 Those are for show and, after the flowers fade, leave gorgeous seed heads that look fab in the garden (or indoors at Christmas). Did you know that leeks that have become too woody to eat at the end of winter can do double duty as flowers? Alan Titchmarsh advises to dig them up, trim back the foliage and plant them in the flower border; they'll soon produce towering blooms. I bought my first ornamental alliums (A. sphaerocephalon and A. hollandicum) at RHS Hampton Court flower show a couple of years ago and was advised to plant the bulbs by August to get them off to a good start. They'll start to form roots and be more able to survive winter. This year they're back on my shopping list as I want more; they'll look fantastic growing near my mum's agapanthus and Iris in the middle garden. I might go for the showstopping huge alliums, Globemaster, but there's a huge range these days, I just have to remain calm in the face of all those beautiful choices. RHS Hampton Court Flower Show is on from 4th - 9th July this year. May already! It's a time I subconsciously look forward to every year. In my head it symbolises the turning of a corner weather wise, putting a first foot on the path to summer's lush colourful gardens and prodigious (or not) amounts of home grown food. It should be the start of being able to plant out. Did I mention that I was an optimist? Back in the real world, the weather has been very disappointing this past week. I've unpacked my winter coat and pressed it into service. And my gloves. If I used an umbrella, that would have seen action this week too. I'm not complaining about the rain (after a dry spell, rainfall always makes me feel like dancing about) but I'd like the sort that's followed by sunshine (and rainbows, please). 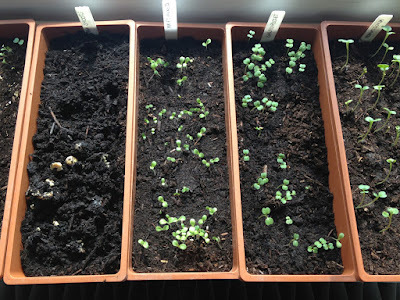 Windowsills are now filling up with seedlings - I get almost giddy with excitement at seeing seeds germinate and check on my little babies daily. A few of the seedlings are almost ready to pot on before being planted out mid to end of May and I've started a cut and come again salad bar which will live on my balcony for ease of access. (There will be bigger salad leaves in the garden.) I'll be doing Facebook updates on the salad bar as I fully intend to embrace the Veg Plotting 52 week salad challenge this year. The original salad challenge took place in 2012 but I eat a lot of salad so I want to try and keep it going throughout the year and will be looking to Veg Plotting for guidance. The veg patch garden is looking pretty lush with all the perennials that were transplanted last year. I had meant to have a cut flower patch but that space was quickly taken up with several pollinator friendly perennial or biennial plants that I moved. A year on and I'm having second thoughts. As pretty as Centaurea montana is, I'd rather have swathes of California poppies ... and I'll have room in the middle garden for the Centaurea. It's essential to keep a few bee-friendly plants in the veg garden so I need to find a balance between annuals and evergreen perennials. I'll park that thought until the autumn as both the bees and I are enjoying the colour fest of Cerinthe, Erysimum Bowles' Mauve, alliums and Honesty. 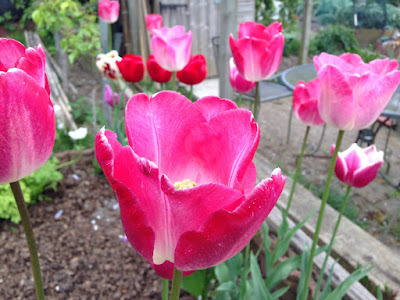 Foxgloves will soon be flowering and achilleas, antirrhinums and geums are also already in flower. On the veg front, kale, chard, wild rocket and purple sprouting are still providing supper ingredients; I've also shared a total of eight asparagus spears (with 3 more being cut tomorrow for a tart). I don't think they're entirely happy where they are as I expected to have more spears than that! I suspect regular watering is fairly crucial. Hopefully by next month I can add broad beans, peas and yellow podded mange tout to the list as I've been nurturing some very healthy plants on my balcony. What I'm most excited about this month though is the appearance of fruitlets on the pear trees! It won't be a huge amount (no surprises there, then) but I counted at least 12 pears just standing in one spot. I'm not sure that the plum trees will rise to the challenge but soft fruit is looking very promising. 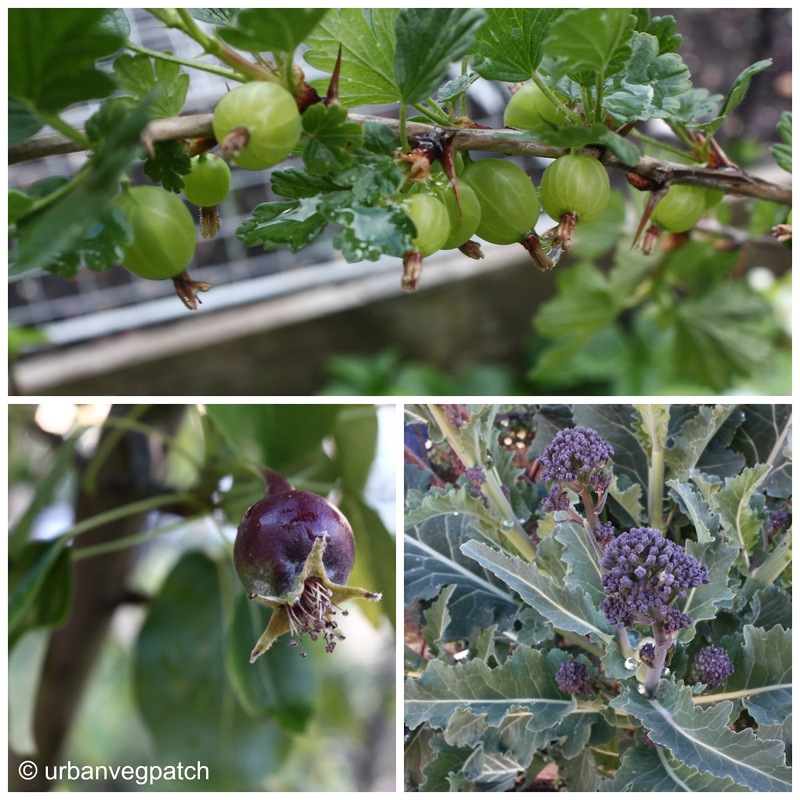 The gooseberry bush is teeming with fruit (first time on a 4 year old bush!!) and the strawberries are covered in flowers so hopefully there'll be a happy tale to tell there in a few weeks. 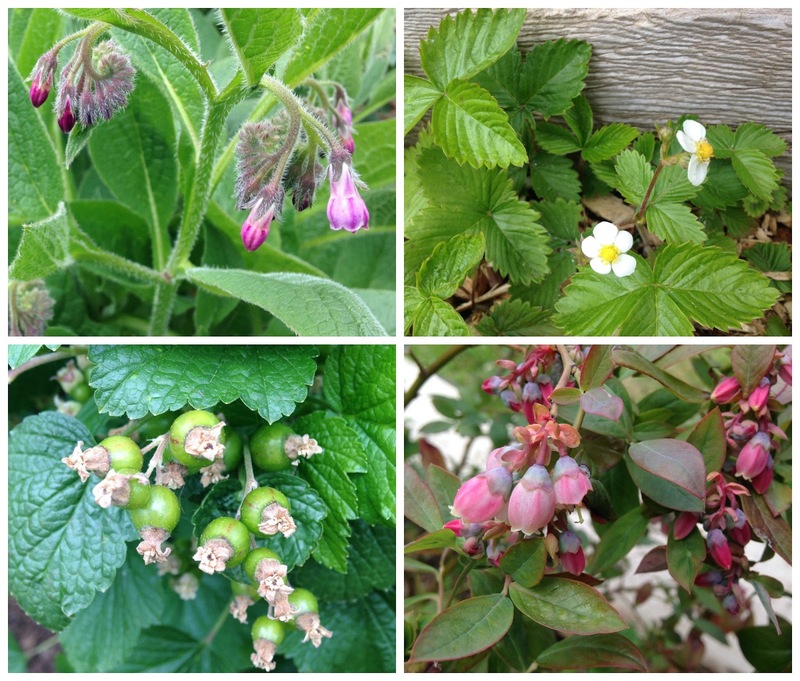 Blossom on strawberry plants is a good indication that it's time to mulch around the plants. I'm going to try Strulch this year; I'm told it's a mineralised straw mulch with a texture that helps to deter slugs and snails. Might be good around beans and other veg too. It's not available everywhere but luckily there's a garden centre, fairly local to me, that stocks it. 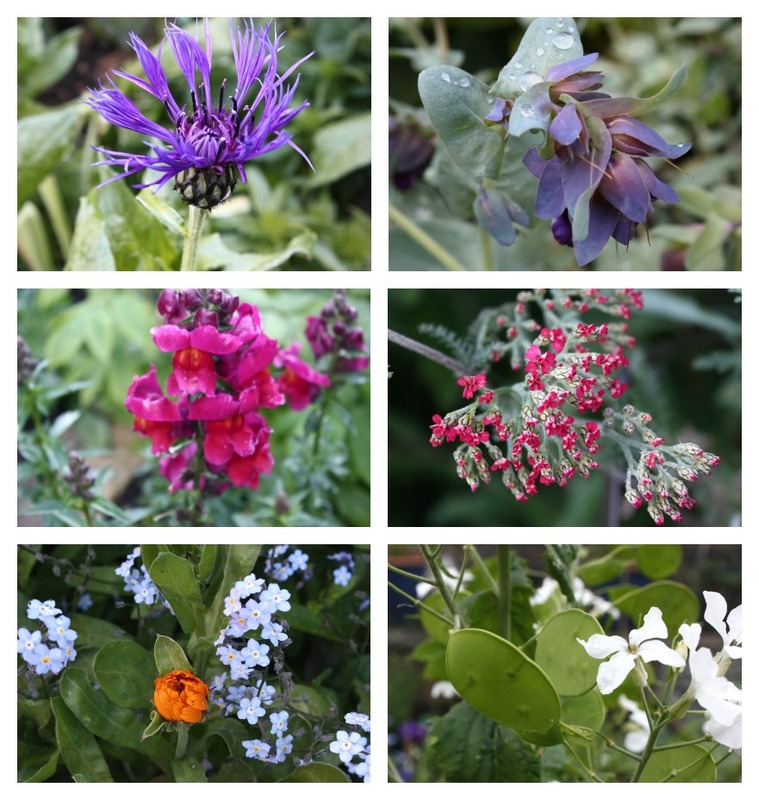 This is such a busy time but I absolutely love seeing it all coming together and throwing off the winter drabness - it seems that the garden knows we're heading towards summer even if the weather can't make up its mind. I often read but am too tired to comment! I hope to have a big catch up this weekend. 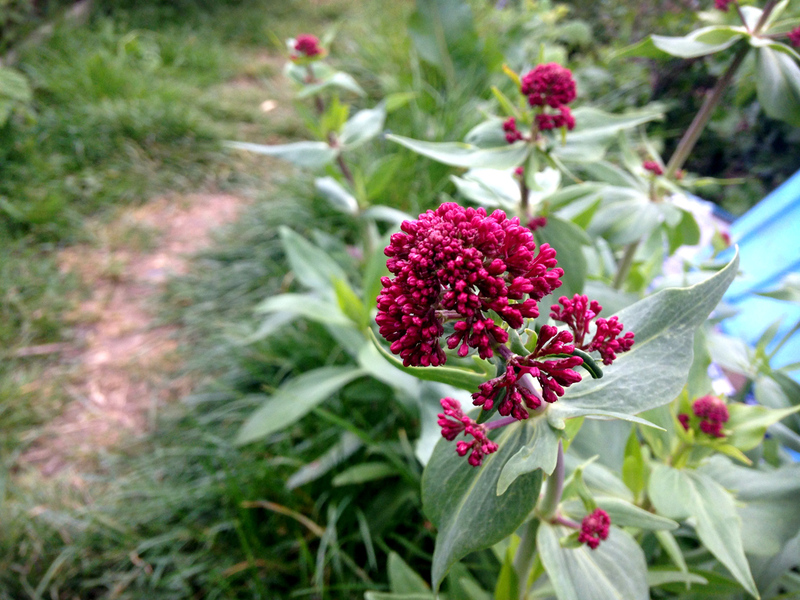 Red Valerian aka Centranthus ruber. 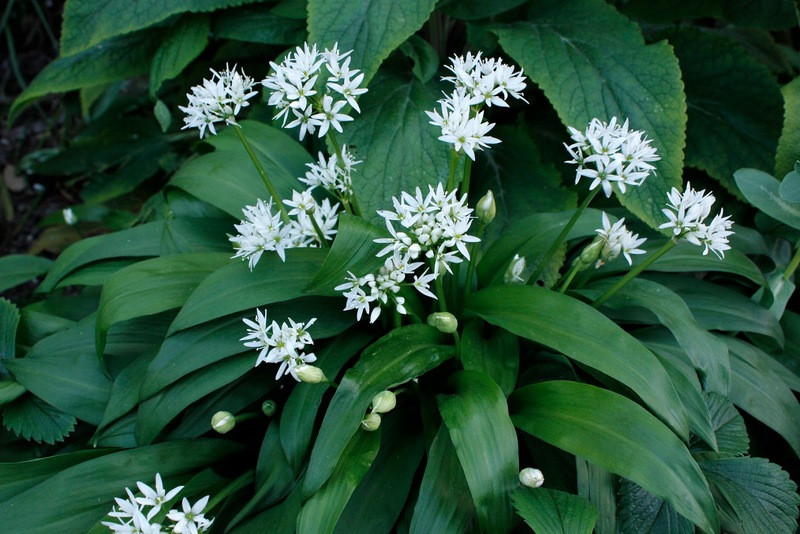 I was excited to read recently that this plant is edible - some say gorgeous flavour, others that the taste is bitter. I've just treated myself to Mark Diacono's latest tome The New Kitchen Garden (an excellent informative read, by the way) and he reckons that the leaves have a taste reminiscent of broad beans. In my opinion that would make them rather yummy. Mark writes that while the new shoots are good to eat in spring and young leaves can be picked throughout the year, it's best to keep the plant watered in a dry spell to prevent leaves becoming bitter. As we've had some good rain in the past couple of days, I feel I'll be tempted to have a nibble next time I'm at the allotment and will definitely be encouraging a few of these plants to grow on the plot. I noticed that a few white ones seem to have made their way into the veg patch borders as well. Very serendipitous! or do you prefer to leave it as a flower? 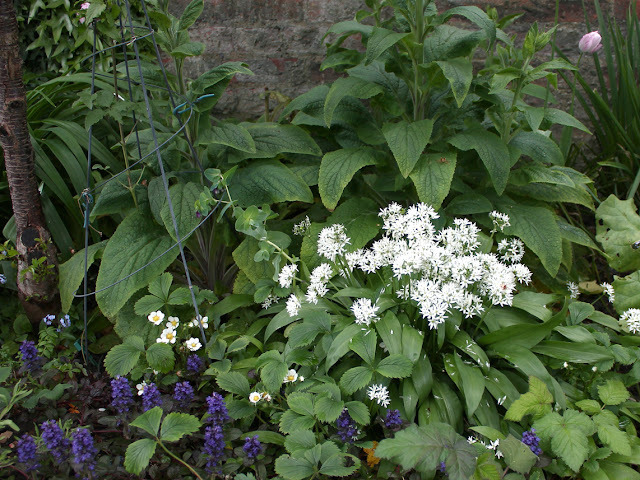 Or perhaps are not fussed about valerian at all? Last month's lesson in plot sharing was, well, sharing. Working as a team. Happy to be there and chipping in together. A month on and, with a few tweaks, that's still working - just about. I'm so used to gardening on my own terms that I've had to rein in my natural tendency to be the boss. I'm also a perfectionist. Quite a tricky combination for shared working! The compost bins have been a bone of contention. Yes, really - compost, who'd have thought? Last year, while Doreen was away, a couple of 'Swiss bins' were installed. Swiss bins are round wire cages with heavy black plastic liners, supposedly able to make compost within six months. 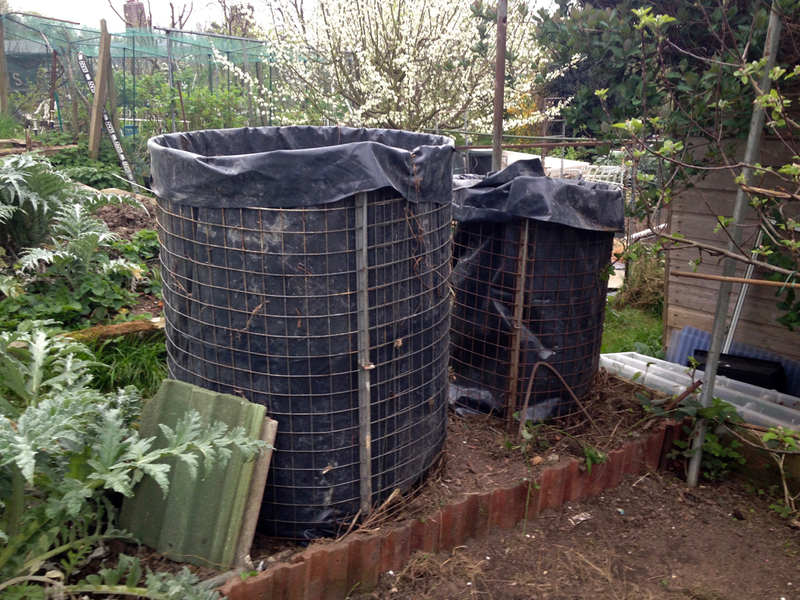 However, the essential liners weren't used last year so the bins resembled two hayricks bursting with weeds. The sight was a constant annoyance to Doreen, particularly as these two huge bins were taking up good growing space in a bed. She'd previously had her own compost bins by the shed but they'd been replaced and the area cleared to make an entrance for prams and buggies. Doreen's favourite saying is currently "This is an ALLOTMENT not a nursery!" which always makes me laugh. It's a sentiment I agreed with - but diplomacy was needed as one of the Other Helper/mums is a jolly good worker when she puts her mind to it. I've realised that there will always be something that grates as we adjust to each other's presence on the plot but at least there's a big chunk ticked off the to do list. 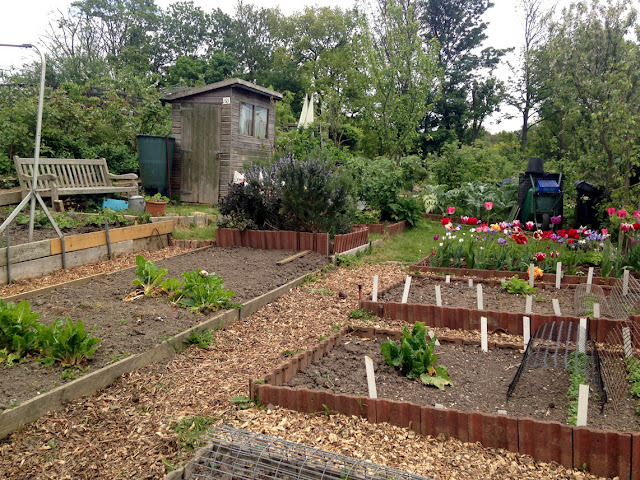 Last month's cleared path has been heavily mulched (by me) with bark chips from the recent tree work on my estate, the rubbish is all cleared, wooden beds have been shored up and salad seeds have been sown. The plot looks good so it's where we should be at this time of year. A quick look round after watering at the weekend has given me fruit envy - there seems to be loads of fruitlets on the plum, apple and sweet cherry trees and the espaliered pear is also dripping with tiny fruits. (I wish I could say the same for the fruit trees at home.) Blackcurrants and blueberries tell a similar tale - there are even wild strawberries to supplement the cultivated ones - and the tulips and anemones are still going strong. Potatoes planted a month ago aren't appearing yet - is that usual? - although self-seeded borage and nasturtiums are popping up among the spud trenches! Love these bright pink tulips on lovely long straight stems. In the coming weeks I'll be sowing flower seeds (I won't say what yet, let's see what germinates) and salad seeds will have been thinned out, maybe even with a few early cut-and-come again pickings. Other crops of sweet corn, courgettes and pumpkins should be ready for planting out (seeds sown into modules today) - and I might even get time to paint the shed!